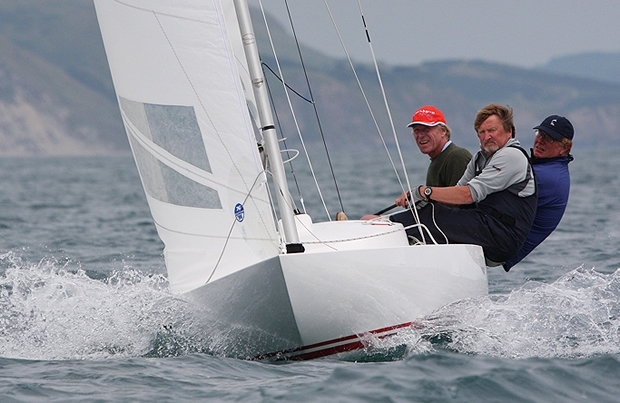 With four of a possible six races now completed reigning Dragon World Champion Lawrie Smith, crewed by Ossie Stewart and Tim Tavinor, has moved into the lead at the 2013 Dragon Edinburgh Cup supported by Aberdeen Asset Management in Weymouth. It was a light and at times extremely challenging day that saw many of the boats add big numbers to their scores, but Smith and his canny cohorts demonstrated once again why all three are ranked amongst the world's best sailors as they kept their focus and added an eighth and a second to their score, making them by far the most consistent performers of the day. Klaus Diederichs, sailing with Andy Beadsworth and Jamie Lea, had another solid day and although they had to work for it at times they remained focused and ended up scoring 7 then 6 to close the day in second place overall, five points behind Smith. Gavia Wilkinson-Cox and her brand new team of Jean Sebastien Ponce and Vicente Pinheiro de Melo was steady in race three with a twelfth place, but then really hit their stride in race four. They made a fantastic start, led the fleet at the first mark and despite strong challenges from Mark Dicker, sailing with James Campbell and Drummond Sydenham, and Mick Cotter, sailing with Simon Fry and Tim Goodbody, defended successfully all the way to the finish. As a result they jump up the leader board into third, two points behind Deiderichs. It was definitely Gavia's lucky day today as not only was she victorious on the water, but she also won a brand new set of Petticrows jib sheets in the post racing prize draw! Today's other race winner was Rob Campbell, crewed by uncle and nephew Justin and Tom Waples, proving once again that the Corinthians can give as good as they get against the professionals. Speaking after racing Campbell paid tribute to the quality of competition, the high standard of race management and the outstanding facilities and race area here in Weymouth, and looked forward to returning for the 2013 Gazprom International Dragon World Championship, also being hosted by Weymouth and Portland National Sailing Academy from 5-13 September. In the Corinthian Division Julia Bailey, sailing with Graham Bailey, Keith Tippell and Will Heritage continues to lead the fleet although she has now dropped down to fourth in the overall standings. Her day got off to a great start with a second behind Campbell, but she then finished 25th in race four which dropped her down the overall leader board. Second Corinthian tonight is Ireland's Simon Brien, sailing with his brother Mark and David Gomes, and Julian and Claire Sowry sailing with Neil O'Hagan fill the third place on the Corinthian leader board. Tomorrow one championship race is schedule which will bring the total sailed to five, at which point the discard will come into play. Lawrie Smith is now the only competitor with an all top ten scoreline with a worst result of eighth, but everyone else is carrying at least one double figures score, so the introduction of the discard is likely to bring big changes in the overall standings. Julia Bailey in particular will be delighted to drop her 25th place from race four as were the discard already in play she would be leading the regatta comfortably. Tomorrow will also feature the traditional Edinburgh Cup Crews' Race where the lunatics are put briefly in charge of the asylum. Will Heritage (who would like us to note that he is 12 years old and not 14 as we stated last night - sorry Will) is hoping to better his second place of last year and as always competition will be extremely hot for this fun event. After racing competitors will enjoy the Edinburgh Cup Championship Dinner where no doubt the craic will be mighty - well it will be if the Kin and Dark and Stormy boys have anything to do with it! The regatta concludes on Friday and with winds expected to increase over the coming two days we can look forward to an exciting finish to the championship.